Child-friendly?Avatar is a sci-fi epic about a paraplegic marine who takes part in a military-backed experiment on a distant planet. The film is heavy on action sequences and there are some violent scenes, which are even more vivid when viewed in 3-D. It will most likely appeal to science fiction lovers but is not a movie for small children. It is recommended for teens aged 13 and up. The story of Avatar follows a wheelchair-bound Marine, Jake, who goes to the planet Pandora to take part in an experiment that builds avatars that look exactly like the blue-skinned inhabitants of the planet, the Na’vi. Jake befriends a female Na’vi, Neytiri, and must decide between following his orders to help drive away the Na’vi so the land they live on can be mined for the valuable material underground or helping the Na’vi people. The film’s special effects are dazzling and the plot has a combination of action and romance that will appeal to a wide variety of movie-goers. The love story between Jake and Neytiri does include some on-screen kissing and talk of mating, although nothing more is seen on camera. However, the Na’vi are scantily-clad as a whole. 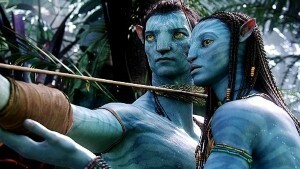 Avatar is director James Cameron’s much-anticipated epic film. It stars Sam Worthington, Sigourney Weaver, Michelle Rodriguez and Zoe Saldana. There are some heavy battle and hunting sequences where some characters die due to explosions, bullet wounds and other equally violent means. The movie also includes some colorful battle-themed language that may be inappropriate for younger viewers. Overall, the film offers a positive theme of the importance of loyalty. It also has strong pro-environment theme. And the characters make tough moral decisions and prove to be positive role models.